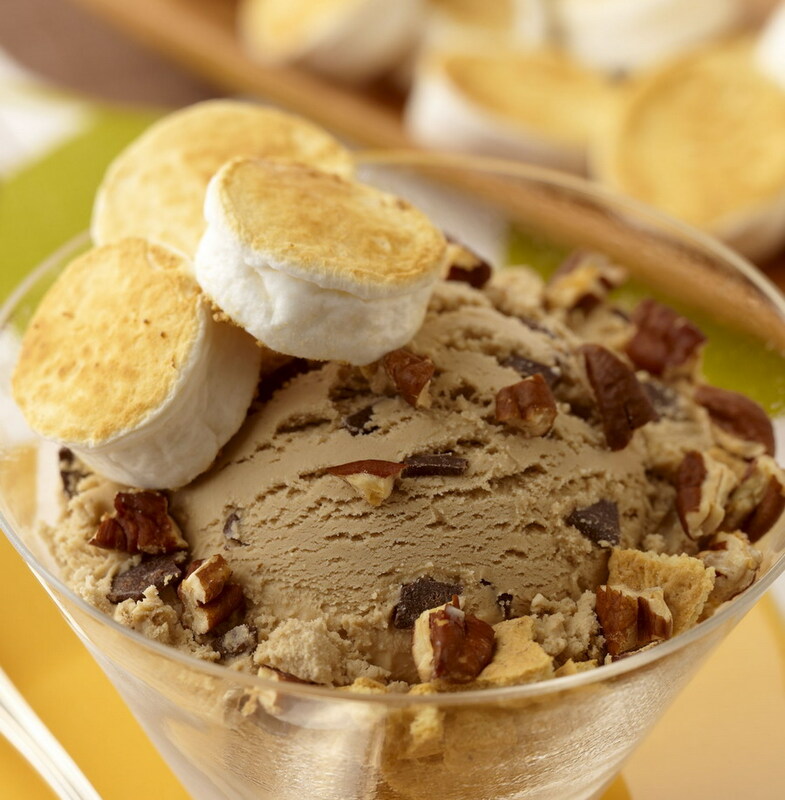 Ice cream is always a simple and satisfying dessert, and with the many intriguing flavors on the market there’s lots to choose from. A new favorite of mine is Häagen-Dazs Five Lemon. When I first tasted it, I thought it was so perfect on it’s own I couldn’t possibly make it better in a recipe. 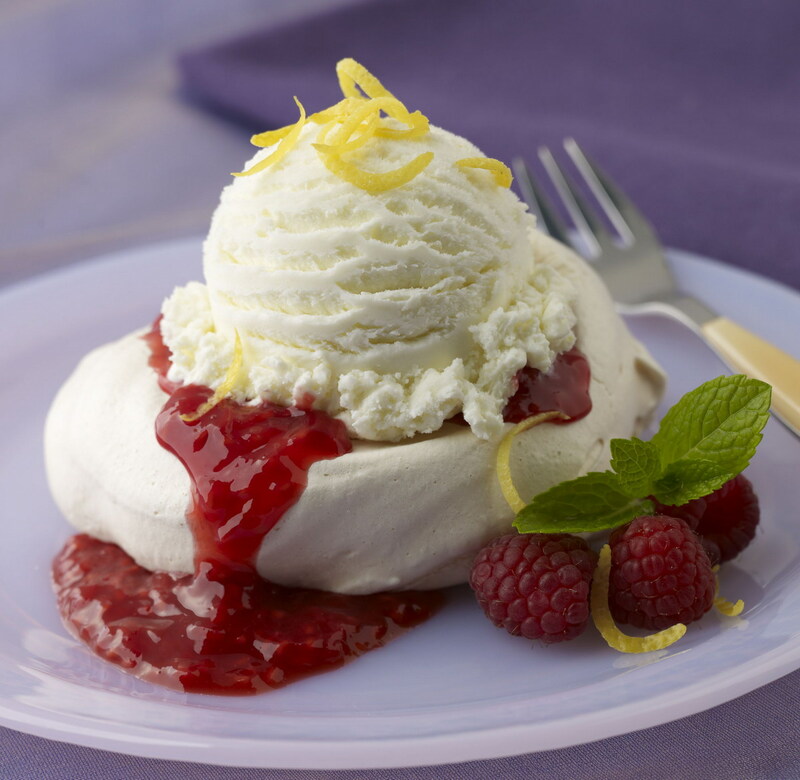 But I did — fresh raspberries and light meringue clouds take lemon ice cream to perfection! 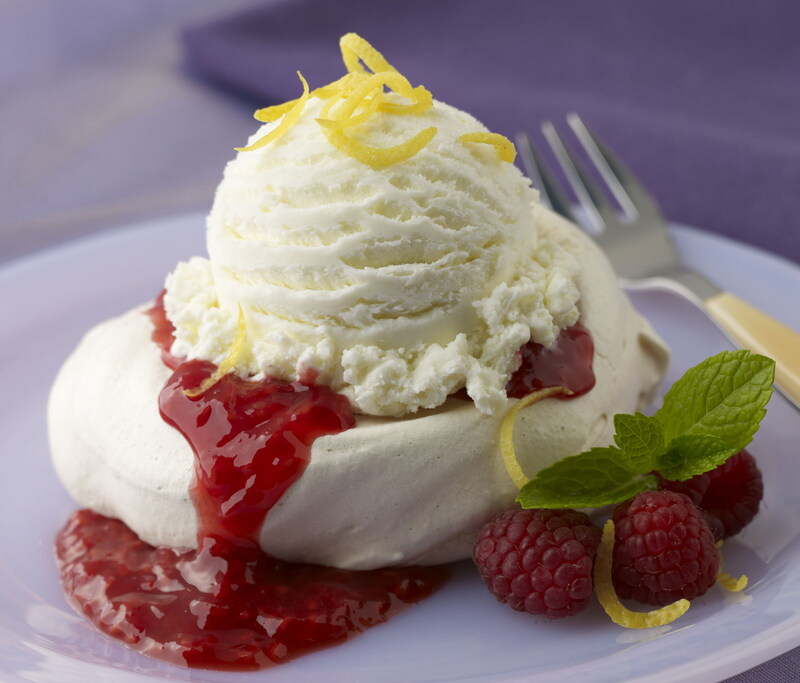 Don’t be intimidated by the meringues – they whip up quickly and can be made several days before serving. Or for a shortcut, just make the raspberry sauce to fancy-up the lemon ice cream! 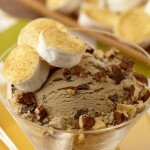 For another ice cream treat that’s a twist on a summer campfire favorite, check this link for a S’mores Sundae . It’s faster than making a campfire! And if you need a good reason to try it (besides liking S’mores), just say it’s National S’mores day, which it is, on August 10. Combine egg whites, vanilla and salt in a large bowl. Beat with an electric mixer until foamy. Gradually add sugar and continue beating until whites hold very firm glossy peaks, about 5 minutes. With a spring-loaded ice cream scoop or large spoon, evenly space six mounds of meringue on prepared baking sheet. With the back of a spoon, form a depression in the center of each mound. Bake meringues 1 hour. Turn oven off and leave in oven with door closed for another hour. Remove from oven and cool completely. Use a metal spatula to remove from parchment paper. Store in airtight container for up to 1 week. To make raspberry sauce: Place 1-1/2 cups berries, sugar, juice or water and cornstarch in a small (1 quart size) saucepan. Stir to combine. Bring to a simmer over medium heat stirring frequently. Simmer on low 2 minutes until liquid is translucent and berries are broken down. Cool. To serve, spoon 2-3 tablespoons raspberry sauce into depression of each meringue. Place a scoop of ice cream over sauce. Garnish with remaining raspberries, lemon zest and mint leaf. Nutrients per serving: 370 calories; 90 calories from fat; 10g fat; 63 mg carbohydrate; 8 g protein; 60 mg cholesterol; 80mg sodium.